Stamp with Melva: Hello again! I'm finally back at being creative - both paper and digital. I've created a lovely scrapbook for a friend Stampin' Up! demonstrators and we stamped and visited for 3 hours. Some of the ladies made the trip down from Kamloops to spend the day with us! What a great way to get the creative juices flowing. I wanted to share some of the amazing cards that these ladies designed. Here's my card. I created this card for my husband's birthday and loved the way it turned out. It uses the triple stamp technique with The Open Sea Stamp Set. I embossed and distressed each of the matted layers before I adhered them to the card. I love how this card turned out! 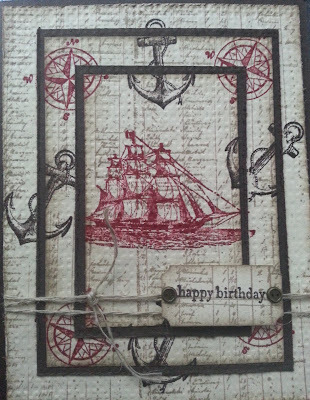 The next card was designed by Diane Evans (check out her blog) and is a variation on the Triple Stamp technique using the By the Tide Stamp set. 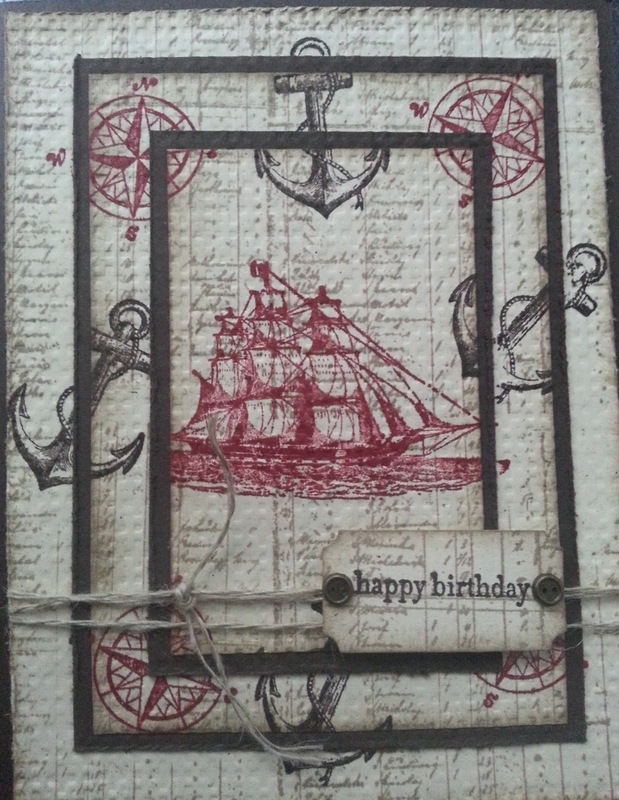 Another beautiful card using the Postage Due Stamp set designed by Karen Gilbert (check out her blog). She's used Designer Series Paper from the Epic Day This and That collection. Love that set of papers! Finally the card designed by my upline, Alison Solven (check out her blog). This stamp set is called Simply Sketched and is a sneak peak from the new catalogue that comes out this Friday. Simply Sketched is a hostess set and can be yours when you spend $200. I love this card - so simple, but very beautiful! I'll share more pictures of the cards we made over the next few days. In the mean time, if you haven't received your new catalogue yet, email me and I will make sure you get a copy! It is amazing with some great new products! I can't wait until Friday when I can place my order. If you're interested in getting together with a group of your friends to stamp or learn more about Stampin' Up! products, let me know. I'd be happy to help you set up a party to do just what we did yesterday - but the best thing is you just have to come to stamp, I'll have everything cut and ready for you!